This week I followed in the steps of many dressmakers before me. 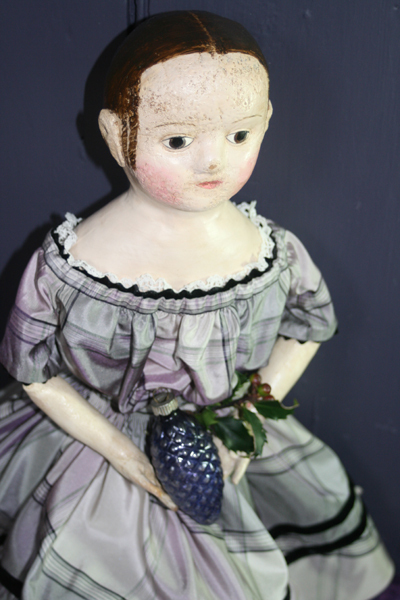 I used the scraps leftover from a two piece reproduction c.1860’s woman’s dress to fashion a child’s gown from the same period for one of my dolls. Frugal seamstresses have been making dolls and their clothing from bits and pieces of fabric culled from other sewing projects for centuries. I thought you might enjoy seeing photos of both the dresses together. 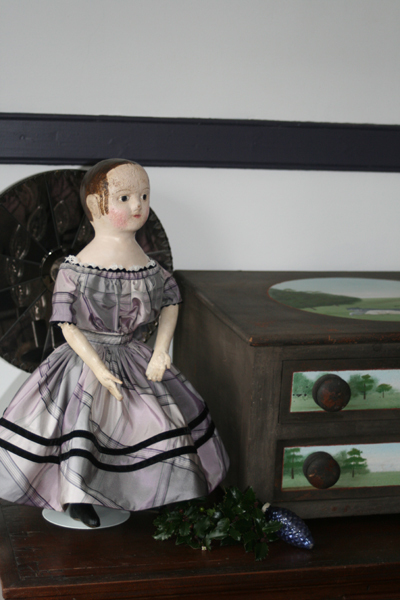 The doll and the dress are shown on an early Rhode Island press bed. 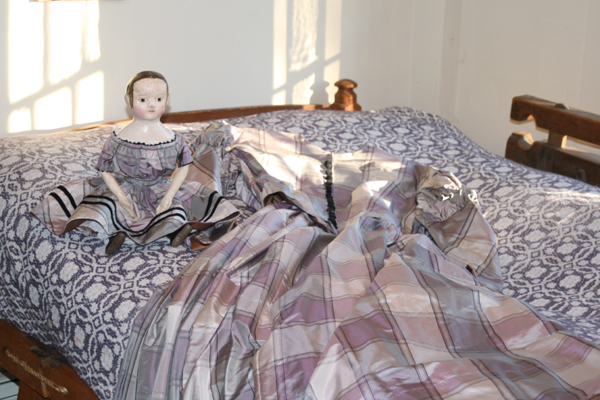 The coverlet on the bed is a 19th century purple and white handwoven linsey woolsey with a center seam. To the right of the bed is one end of an antique Amish quilting frame. The fabric is a plaid silk taffeta. Both gowns are lined in brown polished cotton and trimmed with black velvet. I cut the skirt of the doll’s dress on the bias and cartridge pleated it to the waistband. The doll pictured here is sold. She’s on lay-away. 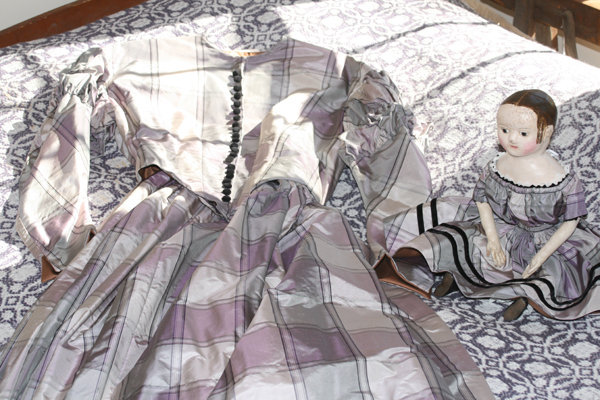 The doll size plaid taffeta dress is available. Previous Post What to Wear??? Oh my Paula, what a superb job with your blog!!!! I’m having so much fun reading and learning. I love the latest dress you’ve made posted here. I’ll stay in touch. I’m adding you to my reading list. You’re work is awesome! Thank you for being an inspiration to my part-time (very PT) affair with making dolls. Thank you! I’m glad you enjoy dropping by and that you like this dress. I love this fabric, there is something really special about sewing with silk.